I’ve struggled developing my home layout for some time. Early last year (March 2015) I decided that I’d build an ‘L’ shaped layout with a 12 x 2 foot set of boards on the upright part of the ‘L’ and two 4 x 1.5 foot boards along the foot of the L.
But it all seemed just too big. It would have been a great layout, and some day in the future when I live to be 300 I might even build it, but for now I’ve scaled back the size of the proposed layout and for now I am just going to use the three main boards that make up the 12 foot section as the entire layout. The other boards will become the basis for another layout that I want to build for exhibition use in the near future. 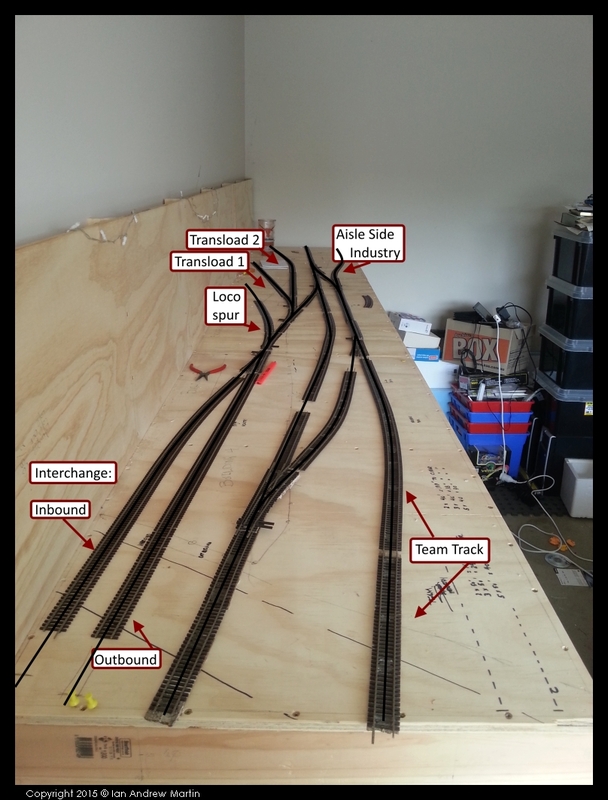 I’ve not used software to design the layout instead putting hands on plywood, track and switches and using my Mod 1, Mark 1 eye-ball to make sure that everything works the way I want it to. I am lucky in being able to call on my model railroading brains-trust when it comes to layout design. No design is ever perfect, layout designs are more likely to be criticised and reworked than any other type. For the moment I am happy with the basics of the design and with the operating scheme that I have produced. The Ops plan works around the limitations dictated by my lack of funds and resources. Specifically I have no more switches available at the moment. While changes to how the interchange works in with the rest of the layout (Chris Gilbert suggested that I should use a 60 degree crossing to get into both the interchange and the Transload facility) would make the design better, I’ve worked the operating plan to make sure that the switching crew can make all the moves they need without causing them any extra “puzzle-like” complications. Is it perfect? No, in fact it is not even close. It is realistic, workable and meets the criteria that I have for simple setup, realistic operations play value, and allows for short (less than 60 minutes) operating sessions multiple times a week when I need to relax. I’ll be chronicling the layout build, my decisions and stumbles along the way.